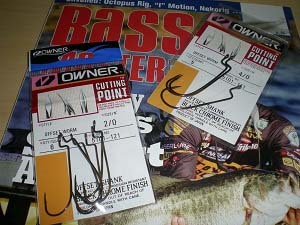 Owner’s new Cutting Point series hooks offers one the best types of worm hooks I have ever used. They stay sharp and offer a differently designed tip that seems to penetrate much better than standard hooks. The Offset Worm Hook features a 90 degree worm holding shoulder at the top which helps keep the worm rigged up properly when you are casting it or dragging it through weeds. 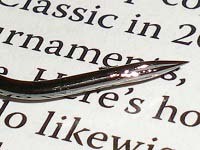 The offset design of the hook makes rigging plastic worms very easy. I used to switch between different brands of hooks trying to find ones that would stay sharp and not get worn too quickly, however now when rigging soft plastics I almost exclusively use an Owner Offset Worm Hook. 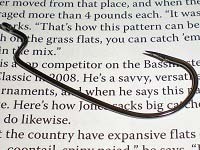 For sizes 3/0, 4/0, or 5/0, the offset worm hooks cost $5.25 and include 5 hooks in a pack. 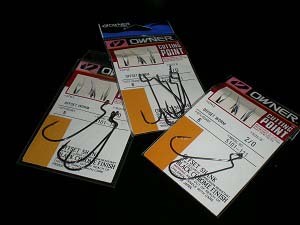 For sizes #2, #1, 1/0, and 2/0, the offset worm hooks cost $5.25 and include 6 hooks in a pack. Overall, I highly recommend trying out these hooks at some point, even though your wallet will take a small hit. They quality and design definitely make them worth it.